Do You Fancy A More Prestigious Living Room? Bask in the vintage arched look of Brightech's minimalist Montage upright light. With a slender cool black or oil-rubbed bronze stem paired with a circular drum shade, the Montage has a classic figure that looks right at home in traditionally decorated living rooms. The open shade displays from a arched/curved hook at the top of the metal body to provide smooth lighting for any occasion. Portable yet sturdy, this lamp has a weighted base that prevents tipping over. Because of its slender design, the Montage positions well by loveseats, sofas, and overstuffed armchairs. Purchase two and place one on each end of your couch, for those nights when you want more abundant yet soft light. With Montage's decorative shade, you're free from the glare of overheads or exposed bulbs. This edition of the Montage Lamp includes Brightech's energy-saving, cool-to-the-touch LightPro LED bulb that will fit the standard E26 medium base socket. Drawing a mere 9.5 watts, the long-lasting LED has every advantage you could think of over short-lived incandescent bulbs. LED bulbs won't fizzle, burn out, or ever make a room uncomfortably warm. Best of all, LED lights doesn't guzzle power! Using LED light bulbs reduces your electricity bill over time. Our LightPro bulb has 800 Lumens, a color temperature of 3,000 Kelvin, and 45,000 hours of radiant light waiting to lead you out of the darkness. Easy to assemble within a half-hour or less, the Montage stands at just over five feet tall (61 ¾ inches in height) with a base diameter of eleven inches. The vintage lamp shade measures nine inches tall by eleven inches wide. A foot pedal switch conveniently powers the Montage on/off, no more grappling or fumbling in the dark to find a fixture knob! Plugs into 110-120V outlets only. Give Your Living Room A Montage Today! 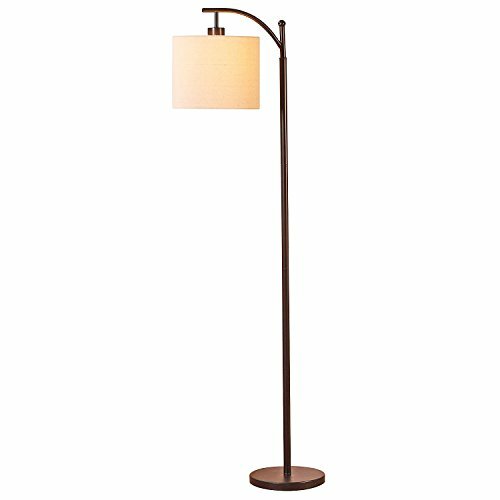 CLASSIC STANDING LAMP FOR LIVING ROOMS OR BEDROOMS - LOOKS GREAT WITH ANY DÉCOR: The Montage fits in any room from industrial to modern or traditional décor. It's simple yet elegant drum shade hanging on an arch makes it easy to place in any room of the house. The black or oil rubbed bronze finish on the metal stem and base pairs perfectly with the warm tone of the Montage lamp's illuminated, textural lamp shade. FITS EASILY BEHIND A READING SPOT, REPOSITIONS WELL, SAFELY: Whether you read books in a recliner, or work at a desk, the Montage fits easily beside your furniture. Its slender design allows it to position well near love seats, sofas, armchairs, side tables etc... It stands just over five feet tall and - beside for the weighted base that ensures stability - is lightweight (12 pounds). so it is easy to reposition. Has a convenient on/off pedal switch. 20 YEAR LIFE LED BULB INCLUDED: The Brightech Montage Floor Lamp includes a 9.5 Watt power saving LED light. so that you will never have to replace a bulb. It's 3,000K warm white light creates a cozy atmosphere. LED technology allows this lamp to outperform halogen or incandescent bulbs, because LEDs don't produce heat. So the bulb lasts 20 year (or 20,000 hours). Save money and energy with the Montage. Note: Bulbs not dimmable.